And now for the reason I have had pearls on my brain. It's almost like one of those advertising jingles that just keeping whirling around in the brain. Perhaps this hop will cure this whirl but I doubt it as I do love me some pearls. Now I do love the old fashioned opera length pearl necklaces, (I need to sit down and make myself one) but I wanted to do something a bit different. And I think that different sums up this necklace. The focal was one I won in a contest hosted by Silver Parrot. I really liked the look but to be honest, I am not one to work with angel wings. Still it was cool looking so I kept it in my shelf where I could see it. And it has a great saying on the back "You were born with wings". And it was perfect for this necklace! No one said I had to use all pearls and since I was looking for something out of the norm, I ended up knotting peach freshwater pearls, bone beads and copper together on waxed linen with a copper clasp from Znet Shows. I do have to say that my flex shaft justified its purchase when I had to drill out all the holes on the pearls. So what do you think? Did I succeed in different? This next necklace is slightly more traditional. Note I said slightly. With this one, I used a focal from HumbleBeads. The beautiful greens in the focal just drew me in and was my starting point. I then found some deep green freshwater pearls which was knotted up with some pewter spacers and beads. I just love how this necklace turned out. I think that it would be perfect with a tank top and jeans. Or maybe a maxi dress. Both necklaces are for sale. Just drop me a line if interested. Now it is blog hop so be sure to click here to see what everyone else has made. 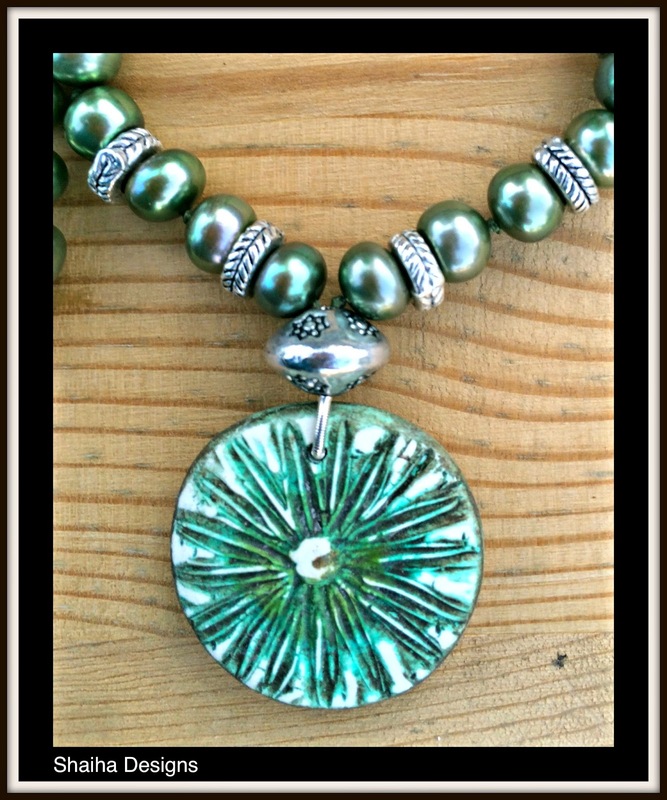 I know that I am looking forward to wandering through blogs filled with pearl loveliness. Wow - these are just super!! The green one is so rich and luscious! 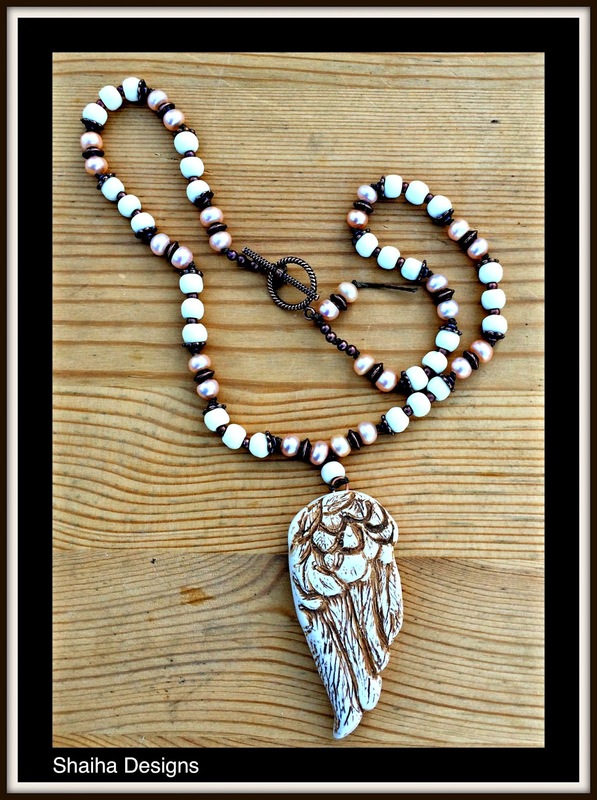 The angel wing one is my favorite - the bone beads, pearls and copper together make for one awesome combo! LOVE it!! Oh, and before I forget, I really like the one you posted the other day - the purple one! I think I spy one of my friend Jeannie's Cherry Blossom pendants on that one and it's just fabulous. Thanks so much for participating in the Pearls blog hop - your designs are amazing! Thank you so much. The angel wing necklace really surprised me. It's not a combo I would usually come up with. I sat down with an idea of using that focal and everything just fell together after that especially as the bone beads had just shown up in my mail. First time I have worked with them but I think that I will pick up a bit more. Both necklaces are stunning. but the dark green one really caught me. I love that your designs are non-traditional. That appeals to me in a big way. I love to see how you have interpreted this challenge and given me something to think about when working with pearls. Great job, Shaiha. I can't seem to do a simple pearl necklace anymore. It seems as though art beads or focals always manage to sneak their way in. Fabulous work ! My favorite is the green one. Very special color. And the mix bone beads with pearls...GREAT. Looks like 2 kind of natural white necklace :-) Thanks for sharing this. Thank you so much! I just loved the richness of those green pearls. I am just sad that the place I purchased them from changed hands and then the quality went down. Lovely Shaiha! Pearls really add a certain luxury to a design don't they! Thank you so much. And that's just it. A touch of luxury. I do like the necklace with angelwing, lovely work! Oh these are gorgeous! I do really love the deep colors in that second one. But the angel wing steals the show for me. So beautifully boho! Thank you so much! I am rather pleased with the angel wing. I love both of your necklaces they are both beautiful in their own right. 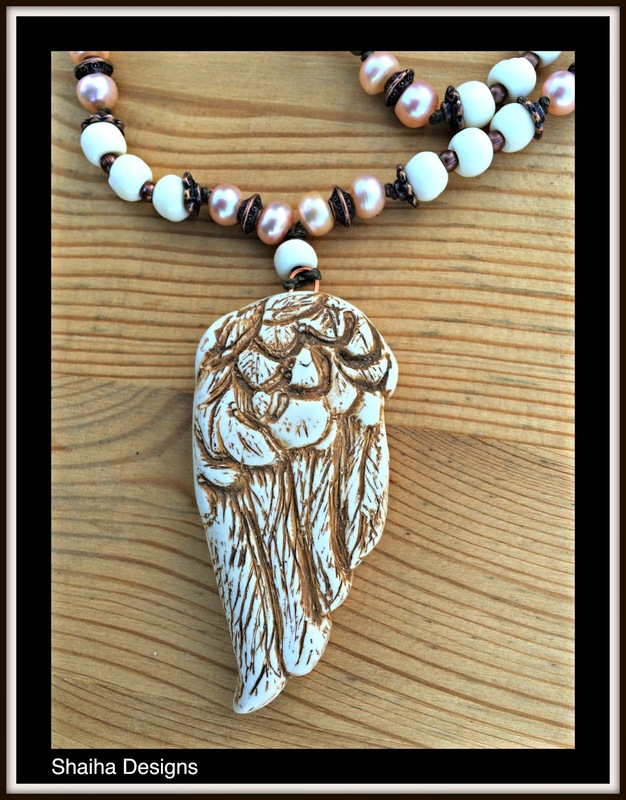 The bone beads in the angle wing necklace are a good compliment to the peach colored pearls. I am with you on creating with wings I just get stumped, but you did a wonderful job with this angle wing. The dark green pearls in your second necklace are gorgeous I need to look for some of those. I picked up those green pearls from Integrity Pearls years ago in its first incarnation. I haven't been able to find any in that rich of a green since. Beautiful, elegance with an edge! Thank you so much. I just love how you put that. Wonderful necklaces Shaiha, that wing is a bit different and it looks great with the pearls. 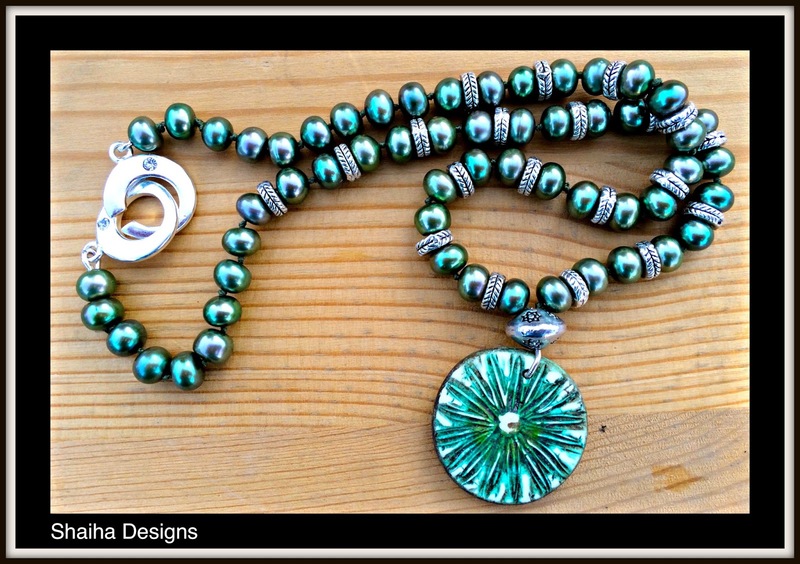 What stunning colour to those green pearls that sand dollar focal is just right too really nice combination! Thank you kindly. I had a lot of fun coming up with different styles. And I agree that the focal from Humblebeads was just perfect for those pearls. these are gorgeous!! love the second one... it is so beautiful!! Thank you so much. They were a lot of fun to create. Wow they are both beautiful. Though I do tend to prefer the first one with the wing....excellent work! Thank you so much. I don't usually create with such subtle colors as the wing necklace but I am very happy with how it turned out. Love that you were inspired to create two such different necklaces! Love the subtle shades in the first one...The wing pendant can be meaningful for so many. But that green...just pops! Perfect for that summer maxi dress, is right! I am with you. For myself, I would choose the green necklace. I just love its richness but I think that the subtlety of the second would go with more outfits. Very beautiful pieces. I love the colors you chose in both pieces. The angel wing piece has such a bohemian look to it, I love the peach, bone, and copper together. Great job! That angel wing necklace ...so simple and pretty! The green pearls in second are amazing. Beautiful work!! I really like the earthiness of the wing necklace. And the green one would go with everything in my wardrobe. I just love that green necklace. It's gorgeous and lush. I like how you used the copper spacers and findings to bring out the details in the wing pendant. Great design choice. Both necklaces are lovely!